8 oz. Baby Bella Crimini Mushrooms. The neat is placed in a vacuum bag with seasoning etc. then vacuumed and sealed. The meat is then placed in a hot water bath 130- 135 degrees F or so and cooked for a long duration. 2 to 72 hours depending on the cut of meat. In this case 5.25 hours. Since there is no air present during the cooking process, the meat becomes more flavorful. So lets get to cooking! I then cut a 1.5" - 2" thick London Broil into two steaks. You can leave as one large if you wish. 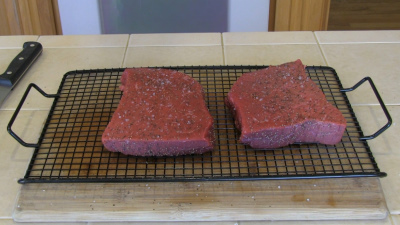 I seasoned the steaks on both top, bottom and sides with coarse ground black pepper and sea salt. Nothing else. 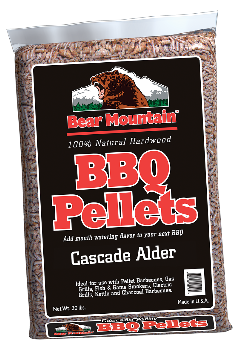 Next I fired up the Amaze-N-Tube-Smoker filled half way up with Bear Mountain Cascade Alder pellets. 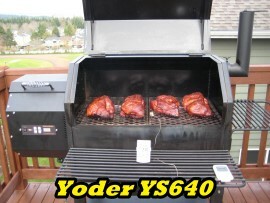 Once my cold smoke was rolling I place the meat in my Yoder Wichita (no heat) just cold smoke. I allowed the meat to bask in the Alder smoke for 2 hours. Ambient temperature outside was 43 degrees and dropping. 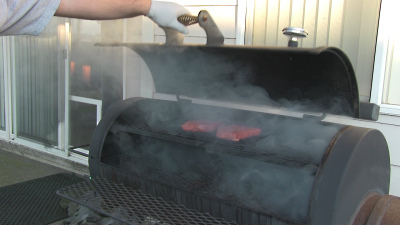 Keep in mind if you do this in hotter temperatures you may want to reduce the smoke time to avoid food safety issues. Once the meat was cold smoked for the 2 hours I sprinkled on a little basil, rosemary, garlic and then placed them into vacuum sealer bags. 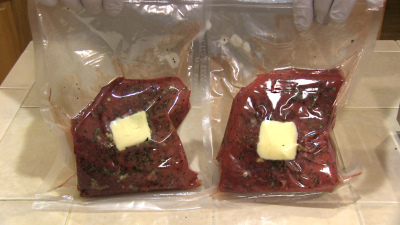 To each bag I added two slices of butter one on each side of the steak. Next I applied vacuum removing all air and then sealed the bags. 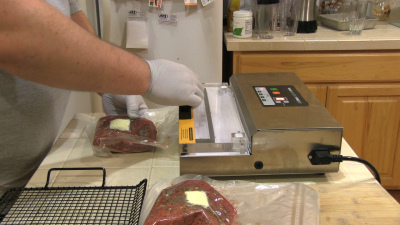 In this case I used the Vacmaster Pro 305 which is an excellent commercial grade vacuum Sealer. 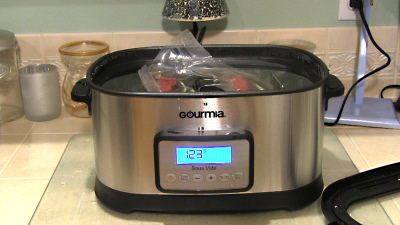 Once sealed I placed the bags into the 134 degree F water bath to cook for 5.25 hours. Once the steaks have cooked for the 5.25 hours I removed them from the water bath and placed them into a large bowl of ice water. This shocks the meat and cools the meat down in preparation for a hot sear in the skillet. I allow for about 15 minutes of cooling in the ice water. 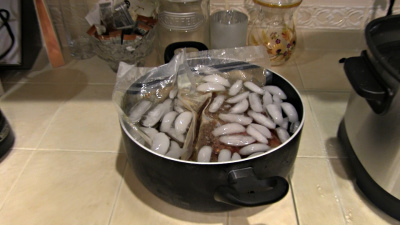 Remove the steaks from the ice water. Cut open the bags and drain the meat juices into a cup or bowl. 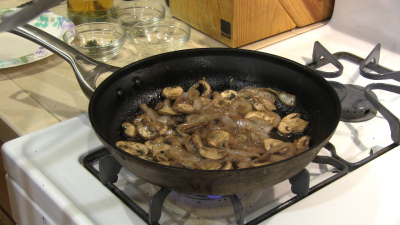 The juices retained will be used to sauté the onions and mushrooms. Pat dry the meat with a paper towel. Sprinkle on a little more sea salt and coarse ground black pepper. Next heated a skillet on high until the skillet started to smoke. Pour in a couple Tbsp. 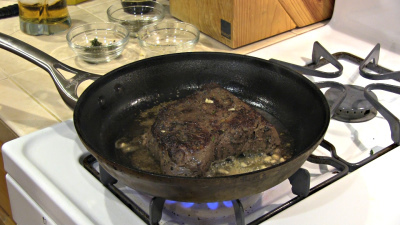 of extra virgin olive and add the steaks to the skillet. Sear 1.5 minutes per top and bottom adding a Tbsp., of butter, some garlic, basil and rosemary after the first side has seared for one minute. Once the steaks are seared quickly flip on all sides to make sure the steaks are evenly coated with the melted butter and herbs. Remove from the skillet and let the steaks stand. De-glaze the skillet with water and dump out any burnt stuff. Place the skillet back on the burner over medium high heat. Dump in the meat juice, Worcestershire and some red wine (approx. 1/4 cup). Add in the sweet onions (three slices cut in half) and 8 oz. of Baby Bella Crimini Mushrooms. Sauté and let the liquids reduce to almost nothing. Add in a little butter, garlic, rosemary, basil, pepper and sea salt. Continue to sauté until the onions are translucent. Remove from heat. Now that the mushrooms and onions are sautéed, the steaks have had the right amount of time to rest. 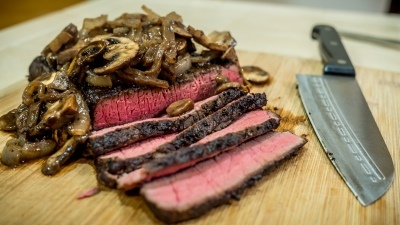 Plate up the steaks and top with the mushrooms and onions. That's it! You should have a steak that is evenly cooked from edge to center. Full of flavor and extremely tender. Enjoy!